Migraine Monologues: Book Club Update: Next Book - "A Brain Wider Than The Sky"
Book Club Update: Next Book - "A Brain Wider Than The Sky"
The inaugural (because this kind of feels Presidential to moi) Migraine Monologues Book Club was a rip roaring success. Lovely participants from Canada to Pittsburgh, to Brighton (we even had a late participant from Australia) joined together to chat about Oliver Sacks' book "Migraine" - and generally converse about life with... migraine. Not all of us had read the book, I hadn't even managed to wade through the whole thing but that didn't matter one jot. If you missed out fear yet not - you can read my review of the book here - and check out our discussion here. "And then a throb hits you on the left side of the head so hard that your head bobs to the right. There’s no way that came from inside your head, you think. That’s no metaphysical crisis. God just punched you in the face." 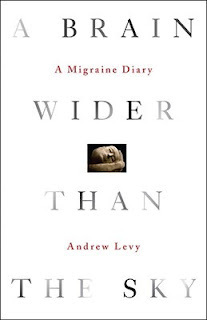 The book is part migraine diary/memoir by Writer Andrew Levy, and an examination of how migraines have affected his relationships with his wife and son, including a look at historical figures who also suffered and the impact migraines have on creativity....or so says Amazon. Monday 10th June - 6pm GMT (UK) & 1pm EST (USA). We'll be meeting in a password protected chatroom - just follow the directions below to join in! As before a review will be posted here, on the day, to form the centre of the discussion. I'll post any updates to the main MM Book Club page but just email if you have any questions and want to be on the email list. 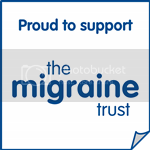 Just wanted to share this excellent podcast from Pain Concern about Migraine with you and your reader, hope it is helpful for someone! 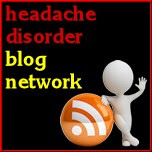 migraine and a lot of other "incurable" diseases. Just check it out and if you have any questions please contact me. Thanks for introducing me to this book - much to my surprise, I had never heard of it. But I got it from the library earlier the week, and am very eager to dive in. I hope I make my way through it and then am able to participate in the book club. Thanks!